ST. GEORGE — A St. George woman was arrested on enhanced charges Sunday night after she was found in possession of methamphetamine in a drug-free zone. While on patrol, St. George Police Officer Zack Bahlmann saw a blue Ford Focus driving east on St. George Boulevard, Bahlmann said in a probable cause statement supporting the arrest. The vehicle was going 38 mph in a 30 mph zone, so Bahlmann followed. According to the statement, the officer drove past the Ford and got a look at the driver. After running the vehicle’s license plate and pulling up the registered owner’s driver’s license picture, Bahlmann identified the driver as 23-year-old Marina Fallon, the registered owner of the vehicle. Fallon’s license came up as suspended. After turning around and again locating the vehicle, Bahlmann conducted a traffic stop and discovered that Fallon had moved over to the passenger seat and a different woman was now driving, the statement said. Fallon admitted that she had at one point been driving, even though she knew her license was suspended. “Marina exited the vehicle and I saw a small plastic bag with whitish residue fall from her jacket,” Bahlmann said in the statement. After Bahlmann witnessed this, Fallon consented to having her vehicle searched, the statement said. During the search, the officer also located a glass pipe containing a burnt white residue consistent with methamphetamine. Both the pipe and the suspected drugs were located under the seat where Fallon had been sitting when the vehicle was stopped, Bahlmann said in the statement. The vehicle was also located within 1,000 feet of the Red Rock Canyon School, a drug-free zone, which caused the charges against Fallon to be enhanced. Fallon was arrested and booked into the Washington County Purgatory Correctional Facility. 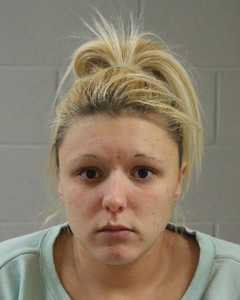 She is charged with one second-degree felony for possession of methamphetamine in a drug-free zone, one class A misdemeanor for possession of drug paraphernalia in a drug-free zone, and two class C misdemeanors for driving on a suspended license and speeding. Her bail for release is set at $22,630 cash or bond. Is there a zone in St. George that is not a drug free zone? Just wondering. Drug free zone in Washington county utah!!!??? Now there is a pipe dream if I have ever heard of one. Drug free zones.? yeah all the high schools in Washington County.! Imagine that,….. a meth user “speeding”, ( as in “go fast”), on the Blvd. Dang speeding tweekers. Get them off the streets! Aside the enhanced charges, did she have an enhanced bust for an enhanced area to hide the drugs? Glad she’s busted but 38 in a 30 gets you pulled over? Nothing better for the cops to do than give traffic tickets. Let me guess, “That’s not mine, its my boyfriends”.